City of Petaluma, et al., v. County of Sonoma, The Dutra Group, et al. This is the last filing of briefs in the appeal of Sonoma County Superior Court Judge Chouteau's decision in the suit against the County's approvals of the Dutra Asphalt Plant adjacent to Shollenberger Park just south of Petaluma. The plaintiffs have filed the Appeals Brief and the County and Dutra filed Opposition Briefs. The date for the trial at the Court of Appeals is still somewhat in the future: the Court of Appeals may take several months before actually setting the trial date, and the trial date could be as much as a year from now. The Plaintiffs believe that we have a very strong case on appeal, focusing on several of the trial issues and rulings. 1. 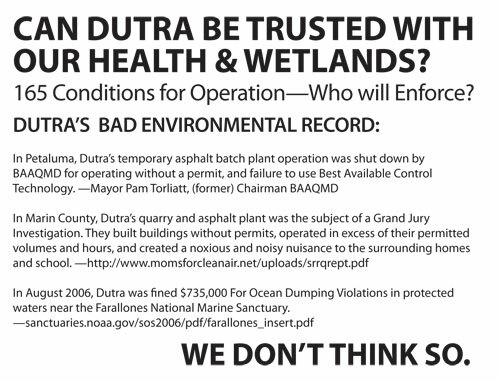 The Dutra properties are in the flood plain, and were improperly rezoned from commercial to industrial use. This is a direct violation of requirements of the Sonoma County General Plan. 2. The Dutra asphalt plant Project is not river dependent, yet were approved despite this basic inconsistency with clear requirements of the County's General Plan. The Project depends on receiving shipments of aggregate and sand from the adjacent Shamrock operations, initially by truck for up to 3 years, then delivered by a conveyor belt. Yet Shamrock has continually insisted that they have no interest and no agreement to provide aggregate or sand to Dutra. The County cannot compel Shamrock to do so. The Dutra Project has no feasible river barge access themselves (due to navigational hazards and existing high pressure gas pipelines), so deliveries would only be by truck. 3. The air pollution emitted from the Dutra Project were inaccurately calculated by the County and Dutra, by using the wrong baseline for emissions. The pollutants discharged from the closed temporary Dutra asphalt plant almost a mile away were wrongly credited against the new plant's pollutants. This artificial 'baseline' makes it seem as if the new levels of pollution and their impacts would be lower. 4. The Final EIR did not accurately describe the final revised and County-approved Project, nor properly analyze and address its impacts, particularly the use of the Shamrock property and its aggregate supply methods, traffic, air quality, worker health, and wetlands impacts. The County refused to circulate a Revised EIR. The public was deprived of its right to examine and provide comments to the Board of Supervisors before they made any decisions on approvals. 5. The County violated the Brown Act by refusing to allow the public to speak about the revised Project at the final hearing of the Board of Supervisors. Despite the last minute release of a series of new Project changes, reports and a new Final EIR, the public was silenced. We are optimistic about the judicial review that will come from the Court of Appeals. We look forward to the trial. We are determined to safeguard the health of our residents, businesses, visitors and wildlife. Many people and businesses have come to enjoy and benefit from Shollenberger Park and the increased use of the Petaluma River. 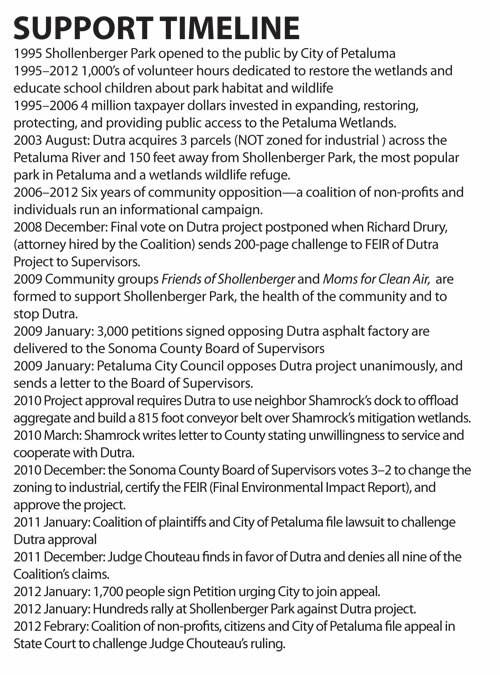 The Dutra Asphalt plant should never have been proposed for the Gateway to Petaluma and Sonoma County. We are grateful to the overwhelming support from our community in this challenge. We appreciate the City's participation in the original lawsuit and this appeal. One final note: While most all Petaluma City Council members have strongly supported going forth with the appeal, we are aware that some people have wavered, citing the city's costs. Most recently, City Council candidate Kathy Miller told SCCA in interview that she would not support continued city participation in the lawsuit and appeal. 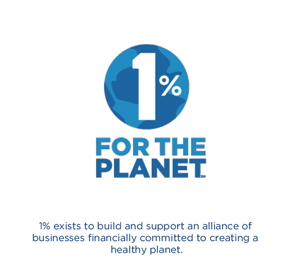 This position is unmerited, as it fails to recognize the generous donation of $5000 from Moms for Clean Air to the City towards the costs of the appeal, and the pledge of another $5000 from Friends of Shollenberger. If the City were to adopt that position and leave the appeal, there would be no chance for the City to recover its legal costs when we win. We are proud of our community, both in and beyond Petaluma, for its strong and continued support. We have borne the lion's share of the costs of the case, and are looking forward to our victory. Roblar Road Quarry Petition Decided in Favor of The Plaintiffs! approval ofthe use of Open Space for the mitigation of endangered species. .. we expect the developer and County to appeal. set aside the County's approval of the Quarry." 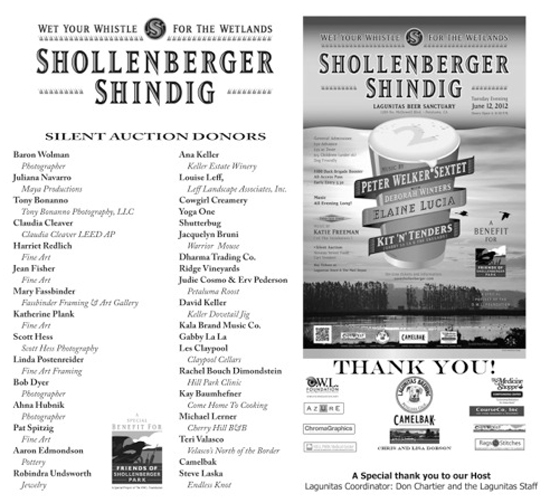 Over 350 people turned out to support Friends of Shollenberger at the Second annual Shindig last Tuesday evening. The goal to raise funds to pay the legal costs to appeal the Dutra asphalt factory approval exceeded expectations! Many thanks to everyone who bought tickets, especially Duck Brigade Boosters, partied for the park, donated and to make this a wonderful evening of community networking and fun. Katie Freeman of The Incubators set the tone for a great party, playing on the stage in the Food Court. Thanks to Katie and her band, the atmosphere there was like a festival. Seated at the long tables, people gathered and ate the delicious food served up by five food carts: MugShot, Pizzeria Rosso, Awful Falafel, Yum Yum Trolley, and Taqueria Santa Cruz. Thanks to these wonderful purveyors of delicious food for serving our community! On the Main Stage in the Beer Sanctuary, Gabby La La and The Ukulady opened the show with their Kit ’n' Tenders ukulele duo, while kids hula hooped or listened in fascination to the music. The inimitable Peter Welker Sextet performed next, filling the space with world class jazz. Singer, Deborah Winters’ performance was mesmerizing. Closing the show as night fell, was the beautiful f Elaine Lucia, singing her original songs with her new band, The Elaine Lucia Group. MC Jason Davies thanked Elaine for her wonderful performance – what a treat to hear Elaine sing in person. In between the music , Jason Davies introduced several speakers. 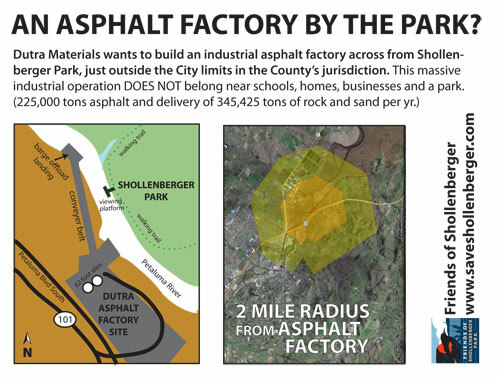 Each spoke about protecting Shollenberger Park form the Dutra Asphalt factory. We heard from former Mayor Pam Torliatt; Mayor Dave Glass, representing the city of Petaluma; and Kristine Weeks, representing Camelbak. 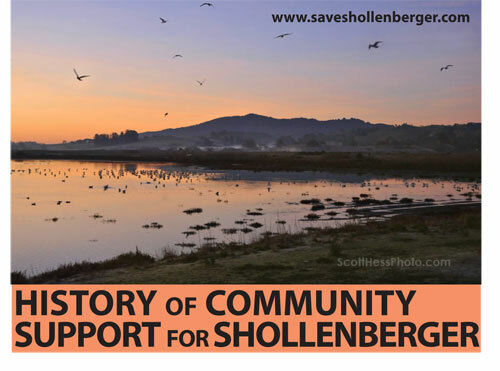 Present in support of Friends of Shollenberger were Council members Teresa Barrett, Tiffany Rene, former mayor of Rohnert Park, Tim Smith, and Congressional candidate Norman Solomon. The O.W.L. Foundation, Petaluma Tomorrow, Camelbak, Azure (town homes,) The Medicine Shoppe, The Out West Garage, Hill Park Medical Clinic, Tom & Carol Isaac, Chris & Lisa Dobson, and Chroma Graphics. Our gratitude to Lagunitas is boundless for the wonderful welcome and hard work of Don Chartier, and the generosity of the founder of the company, Tony Magee. 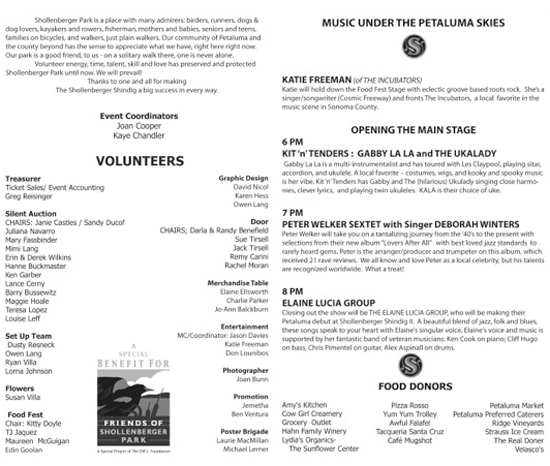 THANK YOU to all the volunteers who made this event the best night of the year for the environment in Petaluma! Petaluma you are the greatest community to live and work in ! Read these flyers, pass them on digitally, & print them out (click on image for printable PDF) and hand them out to friends and neighbors. Appeal Filed: City of Petaluma et al. v. County of Sonoma et al. of Appeals, in San Francisco. future, following discussions among the plaintiffs in the case. The Petaluma City Council voted tonight after a Closed Session meeting, to appeal Judge Chouteau’s Dec. 23, 2011 decision (upholding Sonoma County’s approval of the Dutra asphalt factory at Haystack Landing. ) 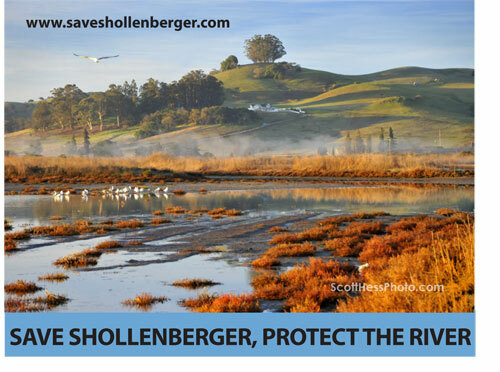 The Superior Court decision will be challenged in Appellate Court in San Francisco by the City of Petaluma, holding together the original coalition of plaintiffs, which includes Friends of Shollenberger Park, Moms for Clean Air, The Madrone Audubon Society, Petaluma Tomorrow, The Petaluma River Council and several individuals. The vote was 6 in favor of appeal, and one, Council Member Albertson, against. to David Keller, Petaluma River Council, to former Mayor Pam Torliatt made a forceful case for the economic basis of funding an appeal citing tourism and Shollenberger Park as crucial economic drivers for Petaluma’s future. The citizen comment period culminated with Sheri Chlebowski , Moms for Clean Air and Joan Cooper, Friends of Shollenberger Park spokesperson making the City Council the offer of $10,000 to help defray the City’s legal costs of the appeal. With the estimate from the City Attorney of a maximum of $18,500, the community has generously ponied up more than 50 % of the City’s projected legal expenses. Mayor Glass commented that the strong response of the citizenry urging the Council to appeal figured into his vote to appeal. He noted that the Dutra issue had catapulted many into political action who had never participated in the process before. 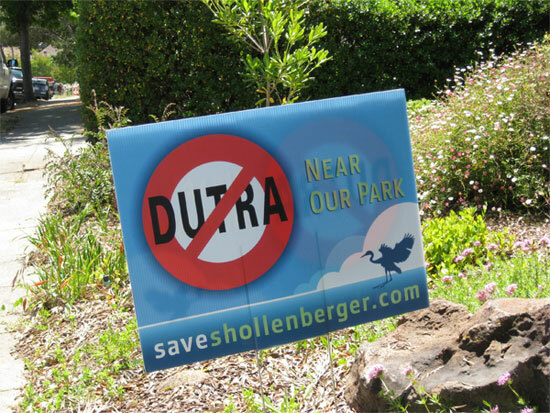 The anti Dutra movement is a reflection of the strong commitment of the people of Petaluma to preserve and protect Shollenberger Park and the quality of life as we know it in Petaluma. Thank you to one and all for signing the petition, writing to the council, donating money and taking the time to come to the council meeting and speak, as well as talking to friends and neighbors. This shows how a community can pull together and make a difference. Now on to the appeal – more fundraising for our own legal expenses will ensue – AND that means more parties! Events! And community fun. STAND UP FOR SHOLLENBERGER RALLY HUGE ! 400 hundred people and dogs gathered at Shollenberger Park to protest the approval of the Dutra Asphalt factory across the river from its paths. Oldsters, kids, dogs on leashes, babies in strollers, bikers, Occupiers all heeded the call to STAND UP FOR OUR PARK given by Friends of Shollenberger, Moms for Clean Air, and Occupy Petaluma. It was a real Petaluma Grass Roots Day – the kind of experience that reminds you why we all love Petaluma and the Park so much and want to live here in peace and good health. Bug Deakin, Heritage Salvage motored gallantly by in his Cutter, then stopped to read aloud his wonderful poem, “Ode to Dutra!” Poetry to tell Dutra to go way and leave our birds alone! Hundreds waved from the Viewing Platform shouting DUCKS NOT TRUCKS and SAVE OUR PARK and NO DUTRA NO DUTRA. The crowd then walked in solidarity together to the dredge spoil pond and stood before the expansive vista of the Measure D Voter Mandate protected wetlands. “Look south,” Bill Kortum, our much loved environmental leader and former Supervisor, once said to me and then Sup. Candidate Mike Maguire. “What do you see?” “Nothing but wetlands and sky,” we replied. “That’s because the voters wanted it that way .” Open and free of industrial blight and development. Yes, nothing but birds and blue sky and a view of a cleaner future for our children and their children. Worth appealing and preserving. That’s something. Photographer Scott Hess captured the inspiring moment of young and old standing together united to save the park. Videographers Sebastian Nau, Kaye Chandler, Beau Bouverat and others filmed the crowd. Friends of Shollenberger wants to thank Lorna Johnson and Eve O’Rourke for gathering the community together by envisioning this Rally and bringing us all together and giving us this wonderful day. Also many thanks to OCCUPY Petaluma who kicked off our rally on Saturday with a wonderful street side demonstration at Washington and Petaluma Blvd. Write your City Council this week – AGAIN. Hear their decision face to face. Join Us! 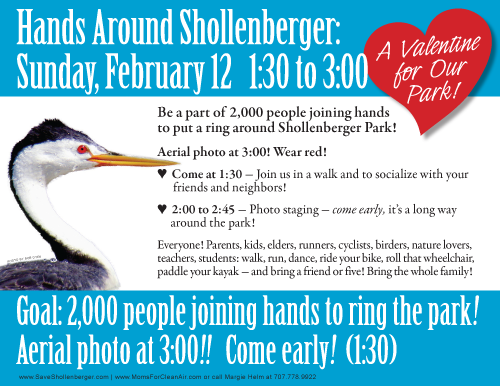 Sunday, January 15 3:30p to 4:30p At Shollenberger Park! Sunday promises to be a beautiful warm sunny day! Perfect for being outdoors! 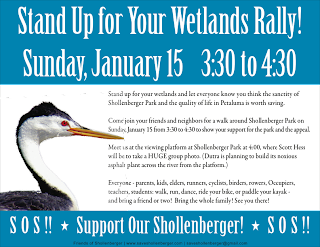 Come join your friends and neighbors on a walk around Shollenberger Park on Sunday, January 15 from 3:30 to 4:30 to show your support for the park and the appeal. Scott Hess will be there to take a HUGE group photo of us at 4:00. The photo will be taken at the viewing platform - which is right across from where Dutra is planning to built its noxious asphalt plant. 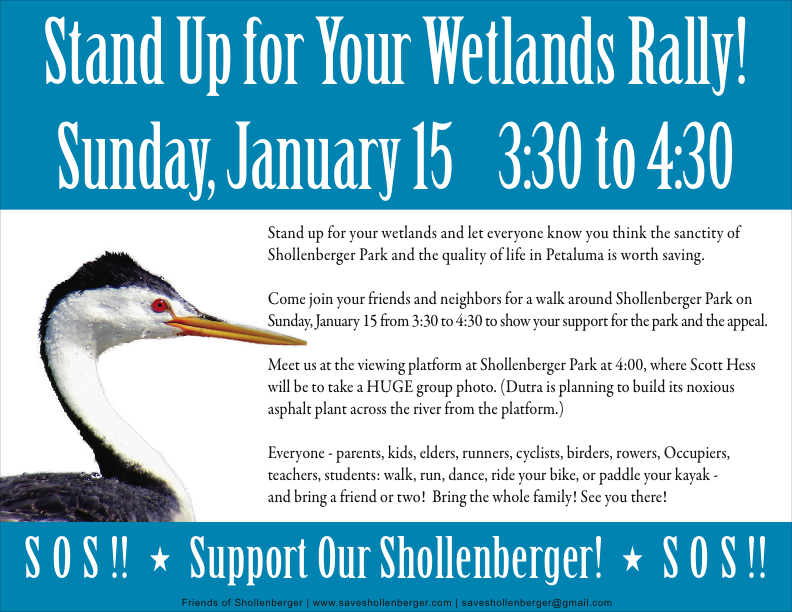 Stand up for your wetlands and let everyone know you think the sanctity of our Shollenberger Park wetlands and the quality of life in Petaluma are worth saving. Everyone - parents, kids, elders, runners, cyclists, birders, rowers, Occupiers, teachers, students: walk, run, dance, ride your bike, or paddle your kayak - and bring a friend or two! Bring the whole family! See you there! Please share this email with your friends! SAVE SHOLLENBERGER JOIN THE APPEAL! Please sign our Petition and send a message to the Petaluma City Council to do what's right, stay the course, join the community coalition of non-profits and individuals as plaintiffs in this appeal. Click Here to download the full text of Judge Chouteau's decision. DONTRA! No Asphalt Plant Next to Our Park! NO Asphalt Factory Next To Our Park! "It Takes A Community" to protect itself. Judge Chouteau's flawed decision needs to be challenged in a higher court. That's why our justice system has an appellate court. Preserving wetlands for the good of the planet and all of us living beings leads to a healthy future. Allowing an industrial factory on the banks of the river is going backwards to the bad old times. 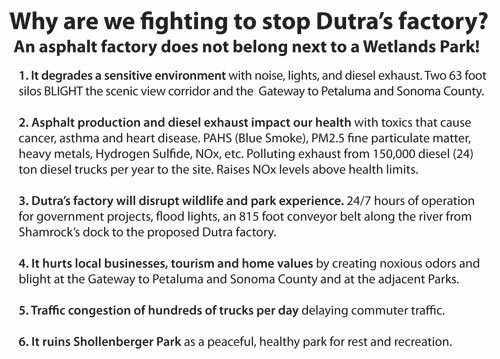 Petaluma doesn't want this factory at its Gateway, but Dutra does. Who wins, who loses? It goes against the 2020 County General Plan guiding principle: The County should cooperate with cities when planning for parcels in their sphere of influence, just outside the city limits. Judge Chouteau's legal ruling doesn't change the DUTRA Asphalt factory. It's still the same noxious factory. Legal errors in Judge Chouteau's ruling make it possible to overturn it on appeal for reconsideration by a panel of three judges in a San Francisco higher court. 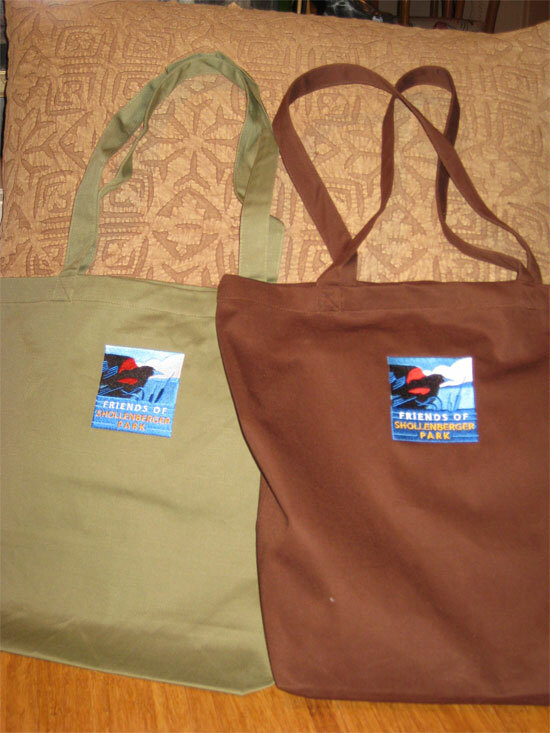 Getting the case out of Sonoma County may help our case. 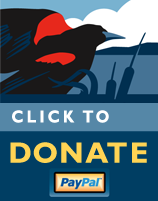 Will you stay the course to protect our park and community? 2. Subject line for e-mails and letters: "Stay The Course"